Machine Head fans, get excited!! It’s been a long time since their last tour, but Machine Head are back in 2018 with a massive worldwide tour and a brand new album, the appropriately named “Catharsis”! The metal heavyweights are coming to rock the Stage AE on Thursday 15th February 2018 – don’t wait about in getting your tickets! 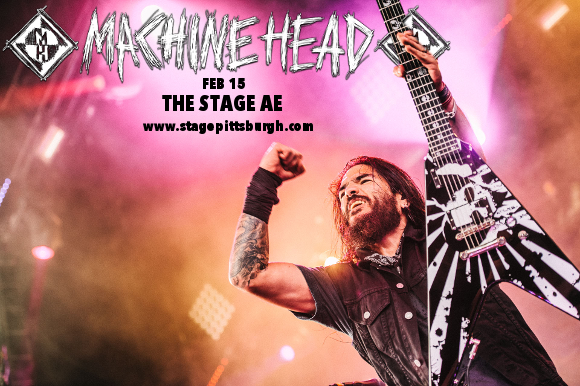 Book NOW for your chance to see Machine Head LIVE!! Machine Head’s new tour will be an unusual one – featuring the band making up for their long absence by treating fans with an incredible 2-3 hours of nonstop metal by the band themselves – pure headliner with no support acts whatsoever! Not a lot of bands could pull off this feat – but Machine Head have proved themselves more than capable. Are you ready to join the other Head Cases in the pit?? Grab your tickets TODAY! !